So, we’ve made the bread and if you like a bit’o’butter, you can make some of your own ‘creamy original’ very quickly, if you have a high speed blender. Now, I was going to do the hand-made version (pop double cream in a jar and shake till it thickens) and although I’m sure my arms could do with a work out, I didn’t fancy a coronary while I rattled about the kitchen, aching like an achey thing. Trust me. ‘They’ say it takes 5 minutes. This took me (I made this a few weeks ago, so my memory is dimming) at least 20 minutes to make it with a high speed blender and elbow grease afterwards, so I suggest you forget the shaky shaky version unless your marbles really have gawn on holiday! Pour the cream into your blender. Switch your blender onto the slowest speed and slowly increase the speed to the highest one. Leave at this setting until you see the cream thicken and the sound of the machine will change (as the mixture changes texture). Stop the blender and scrape the butter down the sides into the main mixture. If you’re using a Vitamix, you want to put the machine on again now at Variable 5 (If using another high speed blender, set at half the top speed). Blend for 5 seconds, scrape down the butter. Repeat the process until the mixture starts to move a little and a liquid forms in the jug. This is buttermilk. Blend a little more until you can clearly see a solid lump of butter in the centre of the jug. Scrape the butter into a finely meshed colander and leave it to drain over a bowl. To extract all the of the liquid from the butter, you’ll need to scrape it into the mesh repeatedly. I found this took a good few minutes and it became so clogged up at one point that I quickly removed the remaining butter from the colander, washed the colander, then popped the butter back in and repeated the process. If you’re adding butter, this is when you mix it in, to taste. I didn’t know this when I made my butter, but apparently, if you want it to last more than a few days, before you shape it (and once you’ve extracted all the buttermilk) pop some ice in your blender, pop in the butter and blend for 30 seconds. This will ‘wash’ the butter and preserve it for longer. You then need to go through the process of straining off that water too. 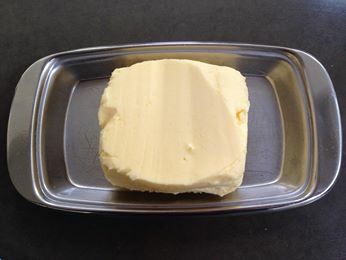 I’ll try this next time I make a ‘normal’ butter. My one did go ‘off’ fairly quickly, so this seems like a rather good idea! Historically, when butter was first made, in the hundreds of years leading up to the industrialisation of butter making, cream was always cultured before it was churned. This culturing was created naturally, by the simple absence of fridges. Cream was stored in a cool room and the natural bacteria from the milk cultured the cream as it sat. This gave rise to a naturally fermented butter, when the cream was finally churned and morphed into a spread.